PC3-12800 6x16GB DELL POWEREDGE R320 R420 R520 R610 R620 R710 R820 Memory Ram. Hover over the Thumbnail to enlarge. DELL POWEREDGE R320 R420 R520 R610 R620 R710 R820. These are all New Condition modules with original HP or Dell labels. These are all ECC Registered Modules! These are mainly for servers and will only work in a small fraction of desktops and workstations! PLEASE DOUBLE CHECK SYSTEM COMPATIBILITY! ECC Registered DIMMs & ECC UDIMMS can not be mixed. If your system came with ECC UDIMMs then use of registered DIMMs will require the removal of all existing UDIMMs. A-Tech is one of the most trusted names in Premium Memory. All of the components in our modules are sourced from the top manufacturers and only utilize new and new condition components. With hundreds of suppliers in our database at all levels of the supply chain, we are able to source the highest quality components at the lowest possible prices. Memory upgrades have never been easier. Designed specifically to help your computer run faster and smoother, an A-Tech memory upgrade is one of the fastest, most affordable, and easiest ways to improve your system's performance. A-Tech memory empowers your computer to achieve faster application loading times, faster system responsiveness, and increased ability to multitask and handle data-intensive programs. A-Tech modules are rigorously tested to ensure that your memory meets our stringent compatibility and performance standards. Every A-Tech ram module is tested for complete functionality before it leaves our doors. Give your computer the best, trust A-Tech! We look forward to working with you and hope that you give your computer the best, and trust A-Tech! At A-Tech, customers come first. ATTENTION: Other limited time deals available. These are identical kits to the one in the listing, with equal compatibility. The only difference is the current listing is 12800 1.5V instead of 12800 1.35V or 10600 1.35V. 12800 1.35V is maximum performance and power conservation at a slightly higher price. 10600 1.35V is slightly slower with better power conservation for the same price. PC3-12800 1.35V 96GB Kit 6x 16GB DELL POWEREDGE R320 R420 R520 R610 R620 R710 R820 Memory Ram This product is designed for customers who want the best performance and power convervation for their computing environment. Take a look into this special offer or the other ones marked below to see the opportunities that A-Tech has in store for you! 1.35V PC3L-10600 6x16GB DELL POWEREDGE R320 R420 R520 R610 R620 R710 R820 Memory Ram This product is designed for people who want the best deal upgrading their systems and also want the best power conservation, but not necessarily the best performance. Take a look into this special offer or the other ones marked below to see that opportunities that A-Tech has in store for you! 4GB Module DELL POWEREDGE R320 R420 R520 R610 R620 R710 R820 Memory Ram. 16GB Kit 4x 4GB DELL POWEREDGE R320 R420 R520 R610 R620 R710 R820 Memory Ram. 32GB Kit 8x 4GB DELL POWEREDGE R320 R420 R520 R610 R620 R710 R820 Memory Ram. 8GB Module DELL POWEREDGE R320 R420 R520 R610 R620 R710 R820 Memory Ram. 32GB Kit 4x 8GB DELL POWEREDGE R320 R420 R520 R610 R620 R710 R820 Memory Ram. 64GB Kit 8x 8GB DELL POWEREDGE R320 R420 R520 R610 R620 R710 R820 Memory Ram. 1.5V PC3-12800 4x16GB DELL POWEREDGE R320 R420 R520 R610 R620 R710 R820 Memory Ram. 1.5V PC3-12800 8x16GB DELL POWEREDGE R320 R420 R520 R610 R620 R710 R820 Memory Ram. 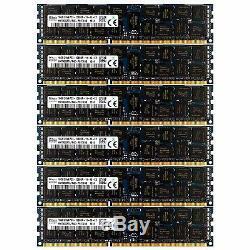 The item "PC3-12800 6x16GB DELL POWEREDGE R320 R420 R520 R610 R620 R710 R820 Memory Ram" is in sale since Thursday, May 12, 2016. This item is in the category "Computers/Tablets & Networking\Computer Components & Parts\Memory (RAM)". The seller is "atechcomponents" and is located in Columbus OH USA. This item can be shipped worldwide.